What could two proposed rules mean for the Ravens? The NFL is currently holding its annual owners meetings in Orlando, Florida this week. Teams were awarded compensatory draft picks yesterday, with the Ravens earning one third, two fourth and one fifth round picks. Among other business at these meetings, the league will vote on 13 proposed rule changes for the upcoming season. Two of the more impactful changes could affect the kicking game. For a complete list of the proposed rule changes, and to discuss your thoughts on this topic, check out our message board. The first is proposal number one, via the Redskins. It would include moving the kickoff up to the 40 yard line for “safety and historic consistency reasons”. The kickoff was moved back to the 35 from the 40 in 1974. Then, back to the 30 yard line from the 35 in 1994. For historic consistency, why don’t they don leather helmets and move the goal posts back into the field of play as well. The league is trying to make progress. Installing a new rule because it’s what they did 40 years ago is just poor reasoning. So how would moving the kickoff up another five yards affect one of the NFL’s best return men, our own Jacoby Jones? Not factoring in punts mind you. The farthest back I can find recorded kickoff data from The Football Database is 2009. In that season with the kickoff still occurring at the 30 yard line, kickers accounted for 2,484 kickoffs with 401 of them resulting in a touchback. 16.14%. In 2013, with the kick moved up the 35 yard line, there were 2,684 kickoffs with a whopping 1,309 touchbacks. 48.77%. Moving the kickoff up five yards meant that there was a 32.63% increase in touchbacks. Would it be safe to assume that if you moved it up another five yards to the 40 yard line, you could tack on another 32.63%, bringing the projected touchback percentage up to a ridiculous 81.4%? We’ll come back to that number in a minute. In 2009, seven players had more than 50 kickoff returns with Danny Amendola leading the NFL with 66. In 2010 that number shot up to 10 men with at least 50 KO returns. In 2013 with the increase in touchbacks, only seven men had at least 30 returns, with one having 40 and one having 50. The Ravens Jacoby Jones checked in with 31 KO returns in 12 games in 2013. Let’s do a little math. In 2013, Jacoby Jones had 31 returns and missed four games. So in 12 games he averaged 2.58 returns per game. Multiply that by 16 games, he would have had about 41 returns had he played all season. Since the league touchback percentage was 48.77%, that probably means those 41 returns account for close to 51.33% of his opportunities. The percentage of touchbacks equals around 39 of Jones’ opportunities going out of the endzone, or with him taking a knee. 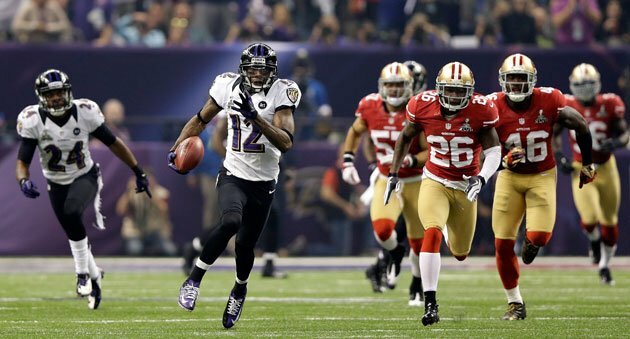 All in all, in a full season, Jacoby Jones could be on the field to return about 80 kicks. Remember that potential 81.4% touchback percentage? If the kickoff is moved to the 40, of those 80 opportunities for Jones, 65.1 would result in touchbacks. Jacoby Jones would return a mere 15 kicks in 2014. Not even one per game. This year he’ll receive $1M in base salary. If Jones returns 15 kicks, and lets be real, that’s what he’s going to be doing most with the number of WR on this depth chart, he’ll earn $66,666.67 for each kickoff return. To put it in perspective, Calvin Johnson will earn $5M in base salary in 2014. If Megatron repeats his 2013 output with 84 catches, he’ll earn $59,523.81 per catch. Essentially, Jacoby Jones could make more per touch than arguably the best offensive weapon in the game not a quarterback. Furthermore, Jacoby Jones has four kick returns for TDs in 133 return attempts in his career. That is once every 33.25 returns Jones takes one to the house. So given 15 chances a year to return a kick, maybe not this year, and if not next year, he would definitely be due to break one in 2016. The other notable rule up for a vote is Proposal number five from the Patriots (because they don’t have enough rules named after them). The proposal is to move the extra point line of scrimmage to the 25 yard line, creating a 43-yard attempt for the PAT. “This is to make extra points more competitive”. It’s one point. It’s not supposed to be hard. But, only four PATs were missed in 2013 and two of those were on botched snaps. So it is about as automatic as you can get right now. There are ways to make it harder, like rescinding the rule they made that doesn’t allow more than six linemen to line up on one side of the ball, so you can’t over load one side to try to penetrate and block a kick easier. Or, allow players to in fact use leverage to jump higher and try to block more kicks. It would place more emphasis on the kicker’s skill to get the ball high enough over the line. For sake of argument, let’s take a look at how this would affect Ravens kicker, Justin Tucker. Tucker earned first team All-Pro, and Pro Bowl honors in just his second season in the NFL in 2013. From between 40-49 yards, Tucker was 10 out of 11 in 2013 for a 90.9% success rate. For his two year career, he’s 20 out of 24, good for 83.3%. The Ravens ranked 29th with just 29 touchdowns scored on the year. (The Broncos led the league with 76). They went for two points three times, so Tucker connected on 26 of 26 PATs. If Tucker makes 83.3% of his extra points under the new rules, that means he would miss 4.3 extra points last year. Call it four to five had the new proposed rule been in place last season. That number only goes up if the Ravens find their offense and score more TDs. You could get lucky and the misses could come at a time when the game is well in hand. Or, it could equate to four to five more losses if they all came with games on the line. Often times that one point comes back to haunt you. Of the 26 Justin Tucker extra points, eight of them either tied the game, or gave the Ravens a one point lead. So why would Bill Belichick and the Patriots want to install this rule change? Patriots kicker, Stephen Gostkowski, is 50 of 68 for his career from 40-49 yards. 73.5%. He’s no Justin Tucker, that’s for sure. It’s hard enough to run a two minute drill, down by five or six, needing a touchdown to win or force OT. Now the team does its job and scores that TD, but you have to make a 43 yard FG/PAT on top of that? Goes back to my original point; it’s one point, it’s not supposed to be hard. Either make it easier on the defense to block, or enjoy the extra 30 seconds at home for grabbing a beer from the fridge or checking on your grill. Written by Mike Randall. Posted 5 years ago in Baltimore Ravens.